Morey sent in a sleeve full of tattoos. 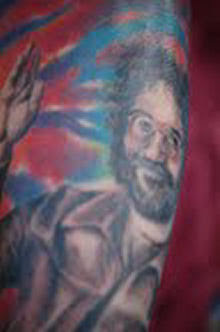 Here is number one - a black and white Jerry Garcia with some colorful tie dye. The Jerry was started by John "Solo" and completed by Scott Olive at Oddity Tattoos.